Rice University's ZEROW HOUSE now resides in Houston's Third Ward. 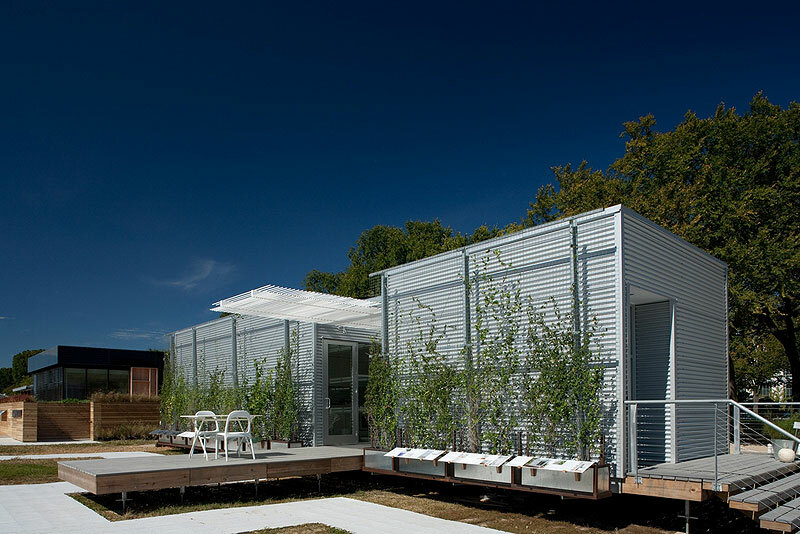 From the beginning, the Rice University team planned to donate its U.S. Department of Energy Solar Decathlon 2009 house to Project Row House, a neighborhood-based, nonprofit art and cultural organization in Houston's Third Ward. The typical row house or "shotgun" house is long and narrow, with rooms connecting one after another from front to back. This design was often used in high-density, 19th-century urban neighborhoods found throughout the southern United States. ZEROW HOUSE adapted the modern solar house to this historic typology so it would suit its intended destination. ZEROW HOUSE joined the Project Row House neighborhood—which consists of 40 properties that house artists, exhibits, low-income office space, and other community essentials—in November 2009. During the reconstruction phase, ZEROW HOUSE hosted numerous tours for interested individuals, organizations, architects, and conference attendees. Since its completion, ZEROW HOUSE has housed artists as part of the artists-in-residence program of Project Row House. Under an arrangement with the Museum of Fine Arts Houston Glassell School of Art, Glassell Core fellows live in the house in exchange for participation in art and education programs. For a year after reconstruction, a team of engineering students at Rice monitored the energy use of the house, thanks to a grant from the Shell Center for Sustainability. Actual usage was very near, if not quite, net-zero.